Nophadrain Extensive Green Roof System The ideal system for installing a low-maintenance extensive green roof system with sedums, herbs and grasses. Suitable for both flat and medium pitched roofs. Nophadrain Intensive Green Roof System Sustainable system for installing complete gardens and park landscapes on roofs using trees, shrubs, lawns and water features. Nophadrain Podium Deck Systems Dependable system for installing pedestrian pavement – setts and cobbles, natural stone, wooden decking – on podium decks and balconies. Nophadrain Parking Deck Systems This system's high compressive strength means that the pavement on the roofs of both aboveground and underground structures can withstand not only cars but even emergency vehicles and heavy goods vehicles. In-house production and product development set us apart from our competitors. Our consultants and engineers will be glad to help you achieve your design ideas. Thanks to their simplicity, our systems are quick and easy to install. King Willem Alexander presided over the opening ceremony of Rotterdam Central Station on 13 March 2014. One of the components of this project is the Kruisplein Garage, a five-storey underground parking garage with 8 parking levels that together can accommodate 760 cars. It is the deepest garage in the Netherlands, its lowest point reaching -20 NAP (Amsterdam Ordnance Datum). 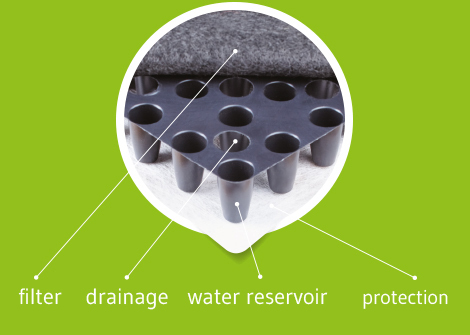 The heavy-duty ND Drainage Systems combine multiple functional layers, such as the filter, drainage, and protection layers, into one product that can be rolled out. This ensures a fast, simple, and safe installation, a tidy building site and an optimal end result.